The bad news came a week or so before the performance – Jonas Kaufmann cancelling all next month performances, starting with Meistersinger in Munich.. Should I cancel the trip and wait for next opportunity? When decided to go regardless of cast changes I made up my mind not to expect too much from the performance – and that certainly paid off, as it has been one of the most engaging and vocally well delivered performances recently attended. 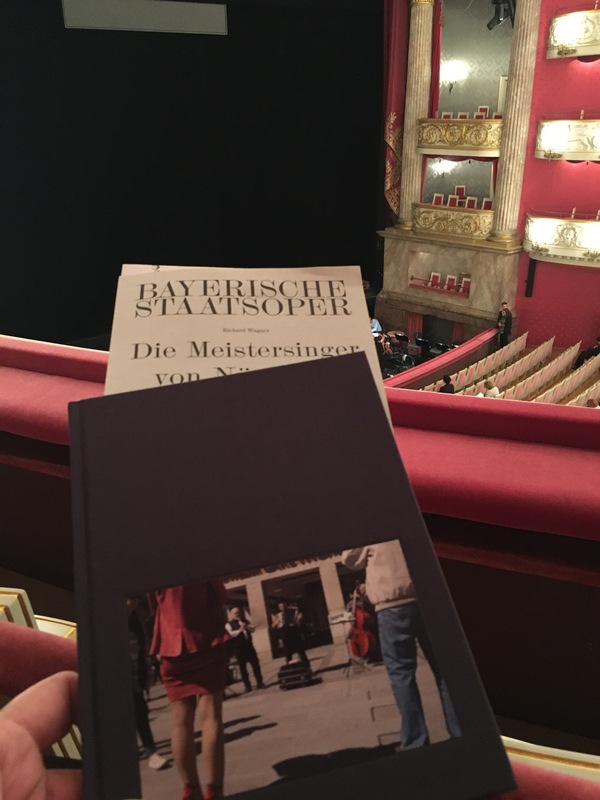 The replacement provided by Bayerisches Staatsoper was announced twice – the first candidate got indisposed as well, which made opera twittersphere to joke about plague in Munich affecting tenors only. Nevertheless, not hyperexcited, arrived for superearly start of performance at 4pm on Monday – since it was a public holiday in Germany. 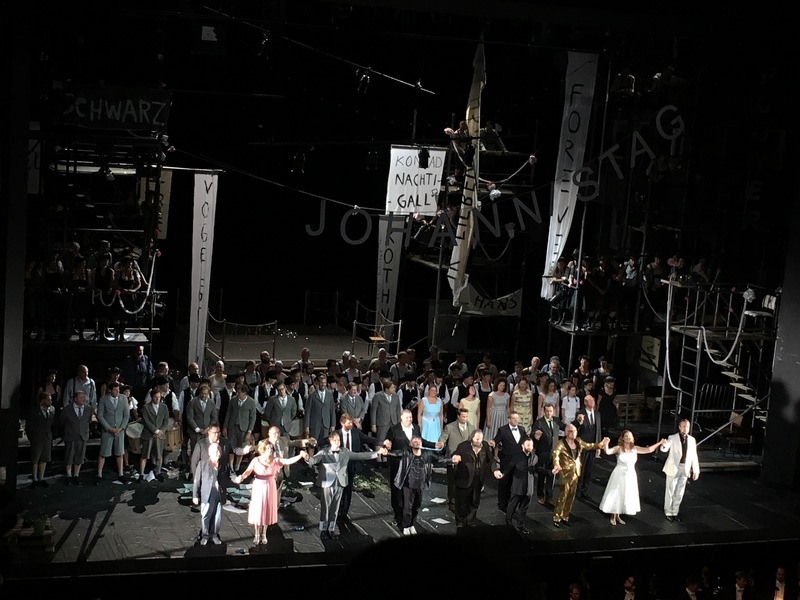 The opera is relatively long, total of 5 hours and 30 minutes with two intermissions, and there are no overtitles in English, so it is a bit of a challenge for non-German speaker. Even knowing the story at some point you might get lost as some words read from the projection board could trigger inner questioning if you are still in line with the story. 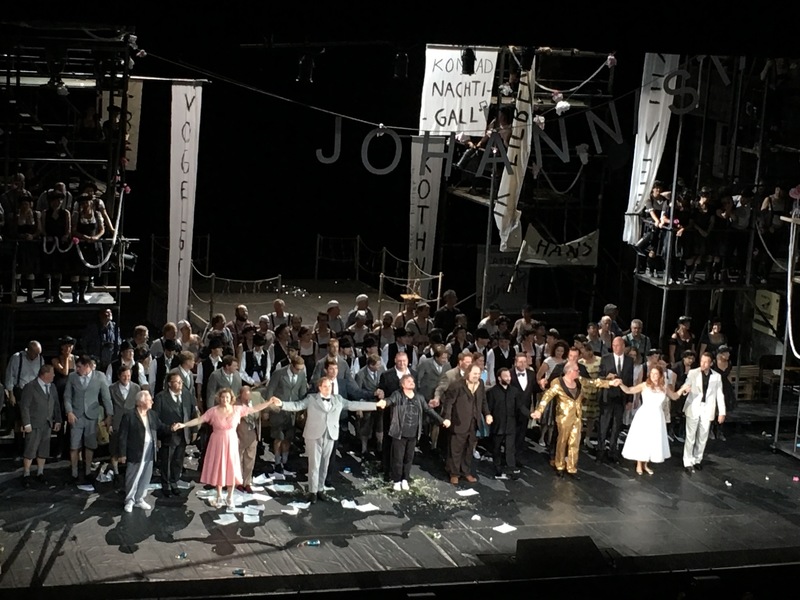 The performance was highly satisfying since an unexpected discovery of fabulous Wolfgang Koch, who created a wonderful character of Hans Sachs and sung with smart use of vocal palette, and acted with dramatic immersion and skill. Martin Gantner depicted colourful character of Sixtus Beckmesser and demonstrated his capabilities also vocally in this humorous but complex role. Robert Künzli as Walter von Stolzing had the most difficult task of the night since most of the audience either expected him to fail or were sceptical even before he delivered a sound. Regardless of challenges, Künzli was able to create a different and very his own Walter, who was not the best-looking guy in the town, but for sure has talent and can charm with his voice and easy-going flair. Unfortunately even ill-fitting costume reminded to the audience that he is just a substitute for the ailing star – the jacket was obviously two sizes too big and even T-shirt sagged from his shoulders.. Was too far to check if the shoes were right fit, but can tell that vocally Künzli fulfilled the task and we heard the story in full – be brave to learn from masters, but do not forget or fear to innovate – this is the right way to win hearts and social standing in the society. The hero of the night was Kirill Petrenko, as his conducting is experience worth to live for – since he recreated my perception of Tosca this summer, I am very keen to hear more and more readings of his baton – and the most fulfilling experience of the night has been watching Petrenko’s hands leading orchestra and singers in perfect harmony towards newly relived experience – so precise, encouraging, demanding – and creating absolutely unique sound from the orchestra pit. Since a few years in addition to the performers’ cast I have been paying more attention to who is the musical leader of the production and conducting on a particular night, and Petrenko is one of those whom to single out and catch those performances for absolute gratification. The sets were arranged in a typical style of recent years – no major set change, except appearing / disappearing vehicles, moving stage/ platform, and various banners and props coming down from the ceiling. Regardless of the staging limitations, all performers demonstrated excellent artistic skill through interactions and active movement on the stage. Wishing Jonas Kaufmann speedy recovery, and still hoping to see him in the role at least during Munich opera festival next summer – since bad luck can’t last forever! 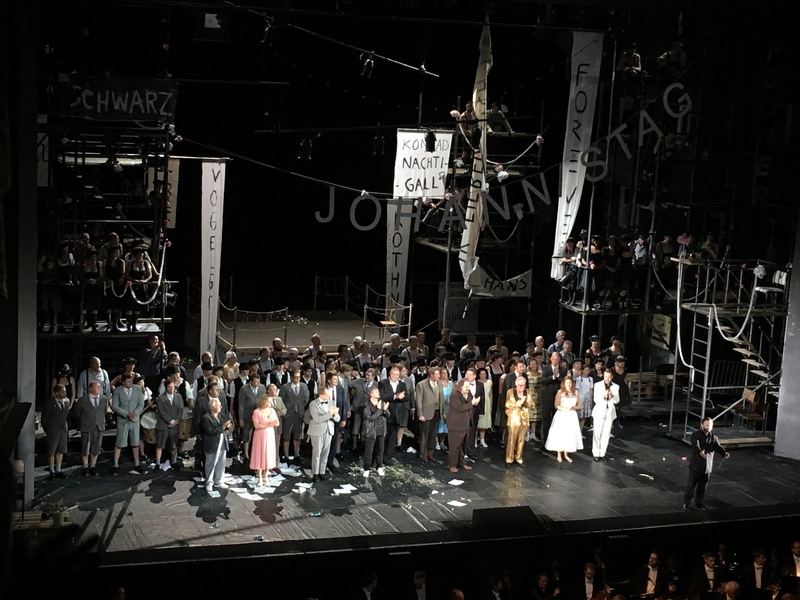 In the meantime, should study libretto of “Die Meistersinger” to become more self-sufficient in purely German language opera house – till July.